This week’s Website of the Week deservedly goes to ForgeAhead. On the outset, a website that presents a very creative and high-impact design but in actuality is an extremely simple layout that will be optimally user-friendly when updating as the client and his business inevitably grows and evolves. Encouragingly, interest in this was expressed even prior to the publishing of the site. The philosophy of Forge Ahead is stated clearly and proudly in the logo’s tagline. ‘Oldschool Methods and Contemporary Science.’ This epitimises what the client is trying to achieve and completely reflects his knowledge and experience in his field. It’s not just about getting fit with Forge Ahead. Emphasis is placed on motivation as well as building character and they specialise in all areas from weight loss and general strength improvement to boxing technique and padwork. Looking at the website you will notice that a very nostalgic and vintage look has been applied to all focal points. This immediately draws in and appeals to fitness enthusiasts and novices alike. 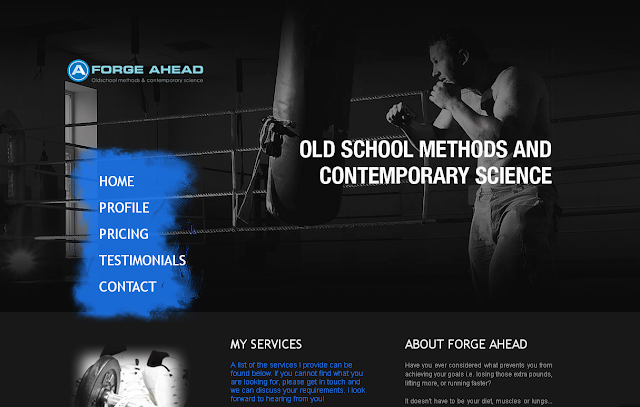 The header of the website is a simple, black and white photo of a boxer, relatable yet inspirational all at once and pleasantly accented by a shock of blue from the side-positioned menu. The menu enhances the vintage and raw feel of the site’s design with a texturised outline while also supporting the logo. The logo design itself is the heart of the website and where the overall look and feel began. It was designed specifically for this client on their suggestions and preferences. As mentioned before it features the all-important moto of the business as well as a ‘catchy’ and very brand-friendly symbol, useful for smaller products. As our logos are all made in high-resolution, this can now easily be used across all forms of branding from small merchandise to large print advertising. The main text font is another key element that pays tribute to the old-fashioned feel and love of the sport that many of Forge Ahead’s clientele will be especially fond of and be motivated by. and gave us 4 and a half stars.